By refusing to sell his business, he's opening his administration up to foreign influence. Thus far, the debate over Donald Trump’s refusal to sell his assets has focused on whether he might use his position to make himself even wealthier, in ways that most people would regard as corrupt. But earlier generations of Americans—including the founders of our country—would have seen his actions in a far harsher light. They would have viewed Trump as a traitor, someone who was willing to become a stooge of foreign powers. “Treachery” was the language used at the 1787 Constitutional Convention to describe a president “in foreign pay.” Pennsylvania delegate Gouverneur Morris believed that the Constitution needed an impeachment clause because a future president “may be bribed by a greater interest to betray his trust; and no one would say that we ought to expose ourselves to the danger of seeing the First Magistrate in foreign pay, without being able to guard against it by displacing him.” Morris conceded that although most leaders wouldn’t be tempted by foreign money, there were exceptions. In the 17th century, Britain’s Charles II received a pension from the French king Louis XIV, and simultaneously avoided conflict to such a degree that one contemporary despaired that England’s role in the world was “to greaten France.” Morris described Charles II’s actions as taking a bribe. “The Executive ought, therefore, to be impeachable for treachery,” he concluded. “Traitor” was also, incidentally, the word used by Hillary Clinton’s opponents because of her relationship to the Clinton Foundation, among other things (more on that later). On the day that Donald Trump takes office, his family will be “in foreign pay.” The Trump Organization will be getting a substantial paycheck from the Chinese government by way of the Industrial and Commercial Bank of China, the largest tenant of Trump Tower. Trump will also be paying interest to China: He’s invested in a partnership that borrowed $950 million from lenders including the state-owned Bank of China. Each of these roles—as landlord and debtor—puts Trump and the country in a position of vulnerability to China. The Chinese government has the capacity to make him richer or poorer, and can use that capacity to influence trade policy and military decisions. Corruption is not a show of ruthless strength or power, but rather of weakness and vulnerability. I cite China as an example not because it’s the country most likely to exercise that leverage, but because the language around Trump’s businesses—“entanglements,” “hundreds,” “complex”—can obscure the fact that they involve a number of powerful nations with specific goals in relation to US foreign policy. These countries will have every incentive to use their leverage—and we’ll have a president who has repeatedly shown a remarkable insecurity regarding his business interests. During a Comedy Central roast of Trump in 2011, for example, the participants were allowed to joke about all kinds of his foibles, but according to The Huffington Post’s Daniel Libit, “Trump Tower made it known that two subjects were off-limits: Trump’s past bankruptcies, and any suggestion that he was not as wealthy as he claimed to be.” So if you think that Trump hasn’t exposed himself to leverage by foreign governments, you’ve got another thing coming. On January 11, responding to widespread concerns about the potential for foreign bribery, Trump announced that he wasn’t planning to do anything meaningful about it. He said that he refused to sell his business and that his children would manage it instead. This means that he will be violating the Constitution’s emoluments clause from the moment he takes office. Trump also made some incoherent claims in his press conference. For instance: “I have no dealings with Russia.… We could make deals in Russia very easily, if we wanted to; I just don’t want to because I think that would be a conflict.” This raises the question of why his deals in and loans from other countries do not constitute a conflict. Trump also said that there would be no new foreign deals, which is essentially impossible. No new deals would mean no lease renewals or term negotiations, both of which are inherent in any business relationship. To take just one example, the Trump Tower lease held by the Industrial and Commercial Bank of China is up for renewal in 2017. That lease renegotiation would be a new deal. Finally, Trump contradicted his own claim that he’ll be removed from his businesses’ management when he told the press that he had “turned down” a major deal as recently as a few days prior. Someone not involved in management has no power to reject deals. In the last few months, several news organizations have reported that foreign leaders and diplomats plan to stay at Trump’s new hotel in Washington, DC, in order to curry favor with him. Trump addressed this at the press conference by saying that any profits coming from these hotels would go to the US Treasury. 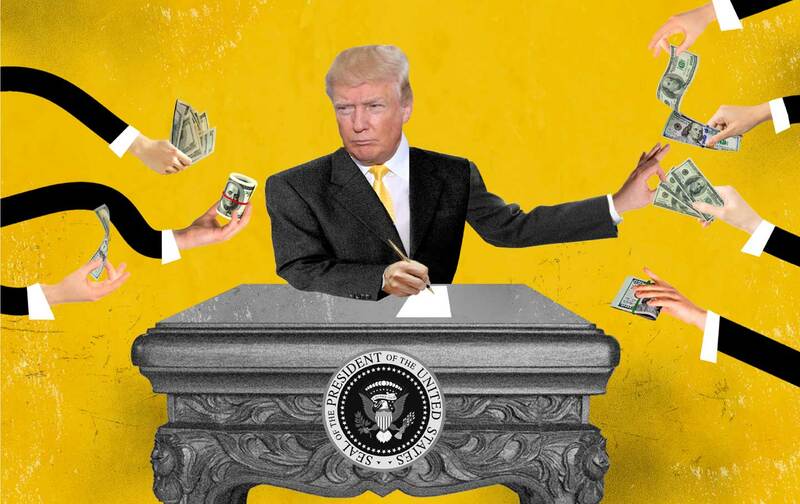 But Trump has no authority to make that decision unilaterally: According to the Constitution, payments from foreign governments (yes, including hotel bills) must be approved by Congress, which might then approve a donation to the Treasury. This has been standard practice throughout the history of our country. For example, when President Martin Van Buren received a horse from the imam of Muscat, Congress reviewed the gift and gave it to the Treasury; Van Buren didn’t act unilaterally. Moreover, hotel visits are tiddleywinks compared with the chess game that we should anticipate from major financial partners of the Trump Organization attempting to influence who we tax, impose tariffs on, and—most dangerously—invade (or whether we refrain from military action). And because the Trump Organization is an ongoing business enterprise, there will always be new players seeking to develop their own leverage. Here’s the important thing to understand about corruption: It is not a show of ruthless strength and power, but rather of weakness and vulnerability. Trump’s decision to keep his business open is an invitation to strategic efforts by other countries. Not all of them will succeed, but it is likely that some will. And the mere fact of this weakness will call into question the integrity of almost all of his major foreign-policy decisions. Does he decide to hold back on confronting another country’s military aggression because it’s the right thing to do, or because he’s worried that the country might retaliate by changing the terms of repayment on money that his business owes? Does he push for greater tariffs on one kind of goods because he’s been influenced by business partners in another country whose government has the capacity to block or approve a major project he wants? Is he enthusiastic about our relationship with a particular government because of the profits that will flow to his organization (and his ego)? During Hillary Clinton’s campaign, a number of commentators—myself included—warned that her husband or daughter taking foreign money for the Clinton Foundation created dangerous conflicts of interest and threatened a violation of the emoluments clause. I believed that her relationship with the foundation when she served as secretary of state was extremely unseemly, at best. Had Clinton been elected president, I would have called for her absolute separation from the foundation. However, while I have no interest in making apologies for Clinton, there’s a significant difference here. Clinton’s role may have been illegal had she maintained familial ties to the foundation. In the case of President-elect Trump, there’s no doubt that he’s engaged in a blatant violation of the law, since he’s receiving direct and personal financial benefits from foreign governments. Congress has an obligation to approve or reject every foreign payment to Donald Trump. The ultimate remedy for violations of the emoluments clause was, and is, impeachment. Charles II’s bribe was uncovered by a parliamentary investigation, and the same will be required here. Violations of the emoluments clause epitomize the very reason behind the impeachment clause: Submitting to “the seductions of foreign states” is a breach of the public trust so serious that it cannot wait until the next election to be remedied. Trump has an intuitive if not actual understanding of the danger of his position. It’s an affront to his campaign slogans: He is putting America second. It’s a daily betrayal of his country, and one that goes straight to the heart of his popularity: How can he “Make America Great Again” if he’s beholden to business cronies in other countries? But Trump cannot bear to let his aura of financial power go, and it’s a weakness precisely because he can’t. It is also one of the most significant dangers he poses to this country.